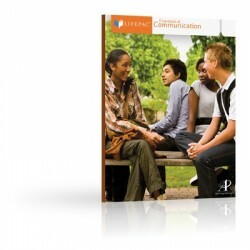 Perfect for every high school program, LIFEPAC Essentials of Communication shows student's how to successfully interact with others in personal, professional, and public settings. This five-unit course discusses: Communication Foundations, Language Characteristics, Interpersonal Communication, Group Communication, and Public Messages. Great for teaching the essentials of effective communication, this exciting course for grades 9-12, creates a solid foundation for a life-long skill.